Today, comprehensive metadata is the best way to market and sell your products. The more complete and specific your book's metadata, the more likely it is your customer will find it. So how do you know your metadata is good enough? At MCS, we live and breathe metadata. We've built a system that brings together elements from many different metadata systems in the publishing and library worlds, to quickly and efficiently create SuperbMeta™, a comprehensive, quality metadata record for today's book market. What's the Difference Between SuperbMeta™ and SuperbMARC™? SuperbMeta™ is the first step in great metadata for your products. 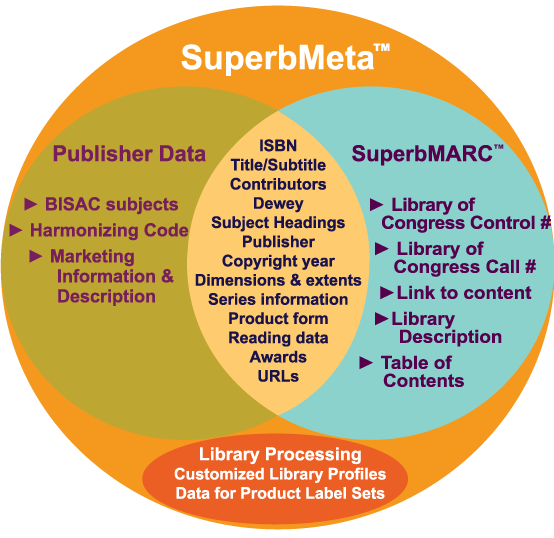 SuperbMARC™ is the next step in great metadata specifically designed for your library customer. Find out how libraries use metadata here.